Peter, who is visiting from Suzhou, mentioned that he would enjoy going out for a bike ride and seeing some of the rural outskirts of Krungthep. I borrowed Markus’ bike (since he’s moved off to Germany and isn’t using it) and cajoled Stuart into joining us for what I promised would be only a 30 km ride in Minburi. Located just north of the new airport, Minburi is a largely rural community with a large population of Muslim families. Rice growing is the main industry there and that means lots of wide open places to ride. The night before the ride I mapped out the route and actually drove part of it, to confirm that the streets were wide enough and smooth enough to safely ride. Sunday morning came. The three bicycles were loaded onto the bike rack and about forty minutes later we pulled into the grounds of a temple under the flight path of jets landing on Suvarnabhumi Airport’s east runway. With just a few minutes of pedaling, we left the wide, traffic-choked city streets behind and were out in the country. We could have been 300 km away from the city, not just 30. 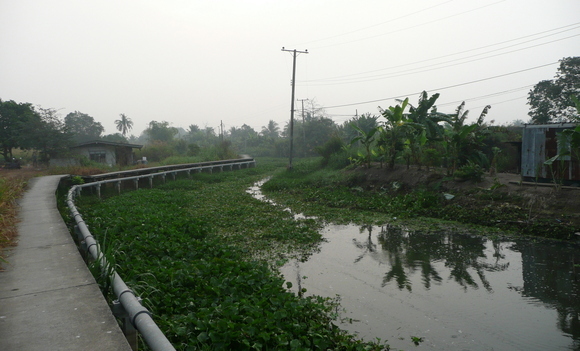 We explored several dead end lanes, crossed several small canals, and even followed an elevated concrete footpath along one of the canals, where an old man and young boy who were fishing advised us to take the next bridge and ride through the local one-lane village. 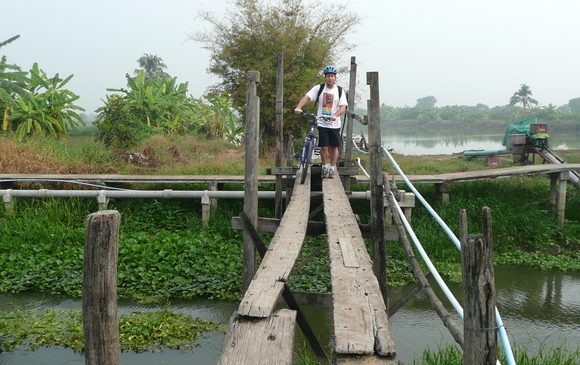 We continued along the path until it came to an end, crossing a very rickety looking bridge. Below, Stuart treads a steady path, knowing his bike won’t float in the canal below. After about two hours we had completed a nice 31-km circuit. After loading the bicycles back on the rack, we set out for home. Very shortly, though, we encountered problems. The plastic pieces on the rack that lock the bicycle rack’s arms perpendicular to each other, failed. Despite having spaces for three bicycles on the rack, the plastic could not handle the weight of the bicycles and the edges of the fasteners actually bent, resulting in the bicycles’ tires dragging on the road. We quickly pulled over to the shoulder and evaluated the situation. There wasn’t a way to fix the rack right there and there wasn’t a way to get the bicycles into the car or even into the trunk of a taxi. And I wasn’t going to abandon my guests and make them ride back to the city on their own. I called Tawn and he took a taxi out to rescue us, my knight on a white stallion. He drove the car back home and I led the ride back to the city, and additional 30 km that we weren’t originally planning on. Along the way we stopped for lunch at a newly-opened restaurant with a rooftop terrace. 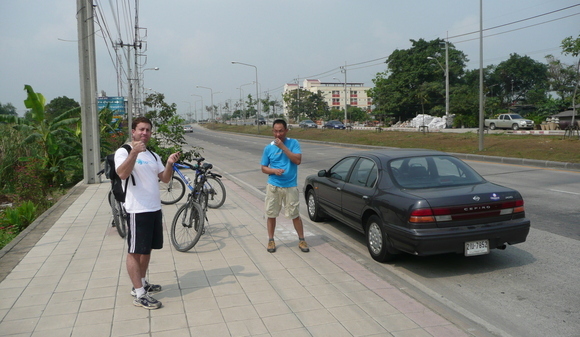 Nice breezes and two bottles of Singha beer eased the discomfort a little before we returned to the road. 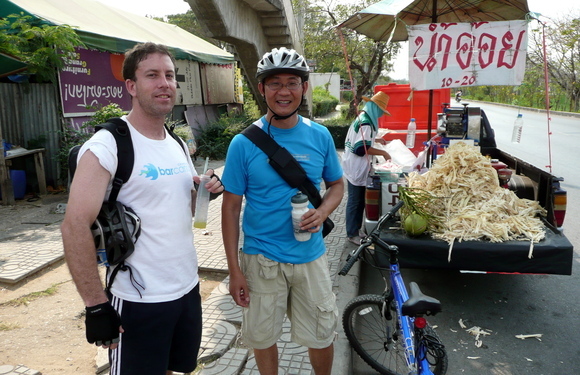 Below, Stuart and Peter stop for some fresh-squeezed sugar cane juice. Who needs Gatorade? Finally, about 3:00 – some seven hours after picking up Stuart and Peter – we returned home. Thankfully, we had some sunscreen and plenty of water, so other than some sore muscles, we weren’t too much the worse for wear. This entry was posted in Uncategorized and tagged Bangkok, Bicycling, Krungthep, Minburi, Thailand by christao408. Bookmark the permalink. I wonder what tasted better – the Singha or the sugar cane juice. I love the green of the rice paddies. wow…that sounds fun, even though it wasn’t in the plans. I like it when things don’t always go as planned. Glad everyone is still smiling. Lucky that Tawn was able to come to the rescue – I hope you thanked him profusely. The country side is beautiful. WOW! I would have loved to be a part of the adventure! What an unexpected adventure! Glad you were able to get hold of Tawn. The picture of the paddy fields is so soothing and beautiful Chris. Sounds like fun anyway! I love the second picture. @murisopsis – Tawn was properly thanked: he received an extra few hours of quiet time without me messing up the condo. @swcheng15 – @CiaoBella810 – @jojobaDESIGNS – Yes, it did prove to be an unexpected adventure. Hopefully, my guests won’t be permanently put off on riding with me! @Dezinerdreams – Come on over for a visit and I’ll see if I can arrange another mechanical breakdown for you to enjoy! @ZSA_MD – Isn’t the green just amazing? Oh my…I can picture you guys biking through the highway all the way back to the city! That’s a good work out! Now that is what I call a bike ride. @curry69curry – Thankfully, there is a good back road and even along the highway, a wide frontage road, so we weren’t in any danger. @blue_beau – Really, you don’t know how to ride a bike? @marc11864 – Next time you’re over here Marc. Start practicing. @Wangium – Yeah, it is amazing how dependent we become on the technologies like Google Maps, huh?